Today saw the fruition of an ambitious project! 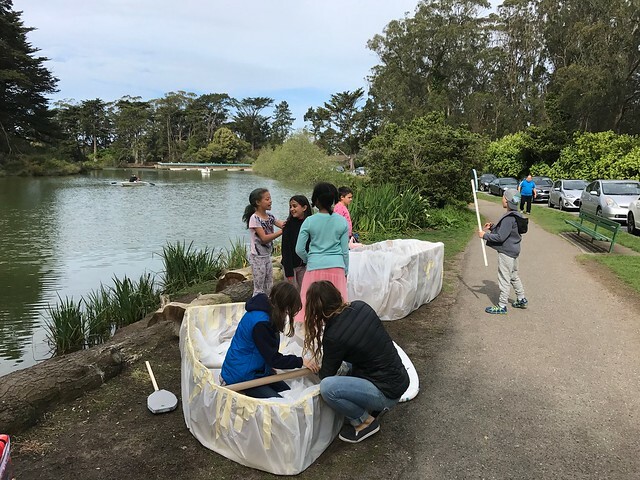 The blue band went to Stow Lake to test the boats they built from cardboard and plastic. 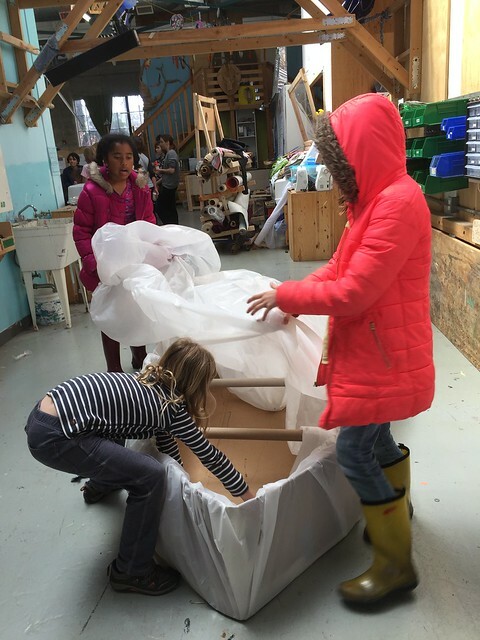 The beauty of this project is that even though both boats ended up as piles of card board slush, everyone came out of the experience feeling like they had done something great. 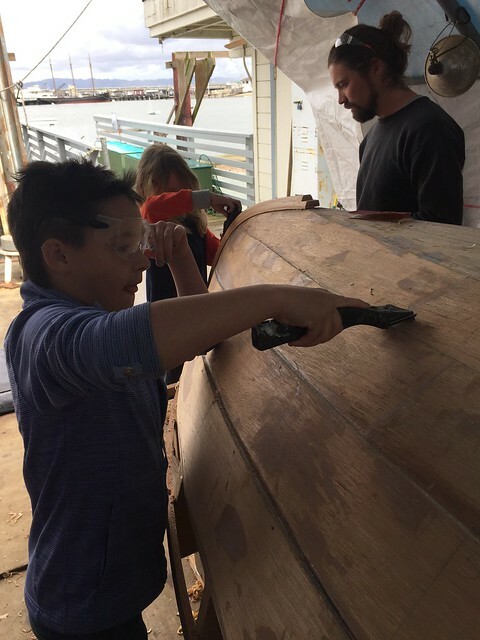 My goal as an educator isn’t to prepare the next generation of boat builders but rather to foster the skills that will help these kids turn their aspirations into reality. In this project we were breaking down and reflecting on the qualities of good teamwork and leadership. 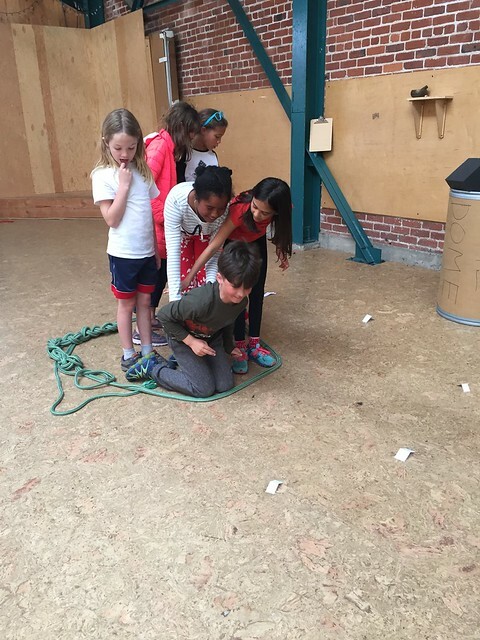 We started this project with a couple of team building challenges. The blue band had to work together to crack the code of this matrix. They discovered that the missteps they made were important information. They had to work together to track and convey the proper order of steps to unlock the puzzle. 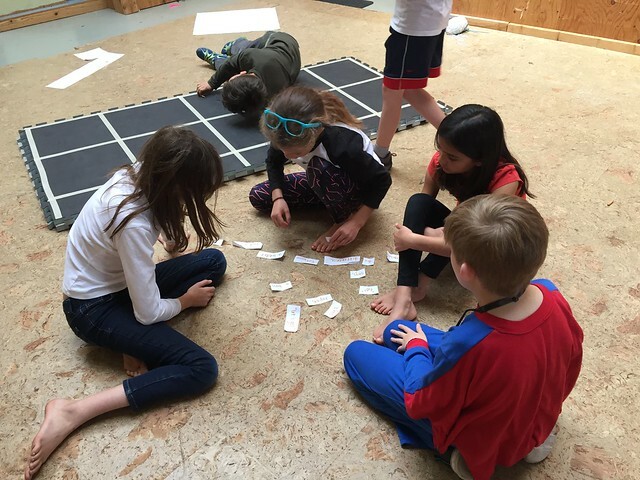 In another team building challenge the students had to stand in a tight circle and pick up pieces of paper far out of their reach. They discovered that to be successful they had to physically counter balance each other and use their words to communicate. Communicate in a clear and kind way. Listen and snap ideas together. Care for each other when we make mistakes because they are important parts of learning. Appreciate other people’s strengths instead of focusing on what they aren’t doing. Because we were working in a new medium with a dangerous tool, we sat down with a cardboard master, our very own Willow. 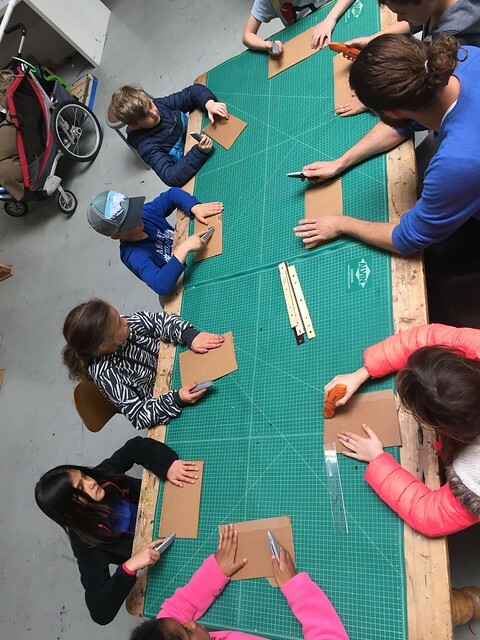 He gave the students techniques to cut cardboard safely and effectively with a box cutter. Thus prepared, the blue band was split into teams and got started sketching and modeling their ideas. When the teams had settled on designs they got to work cutting and taping together their boats! A mantra for those easily distracted was, “How can I help?” For those who were trying on leadership roles, they practiced seeing people’s strengths and passions and finding jobs that leveraged those strengths. 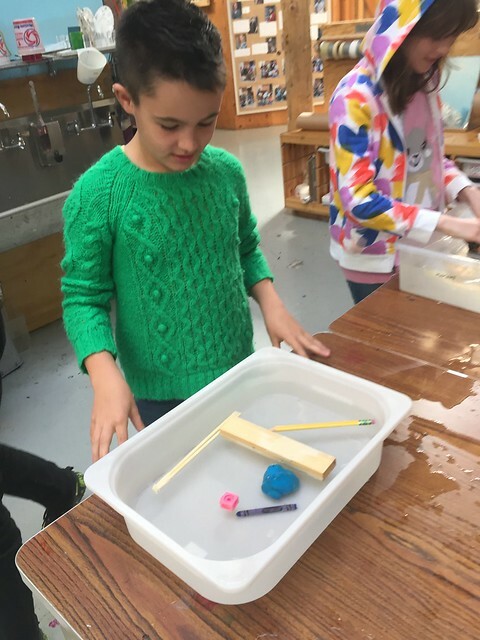 Ronan and Isaac applied the laws of buoyancy that we’d been discovering in order to calculate how much weight their boats could safely carry. 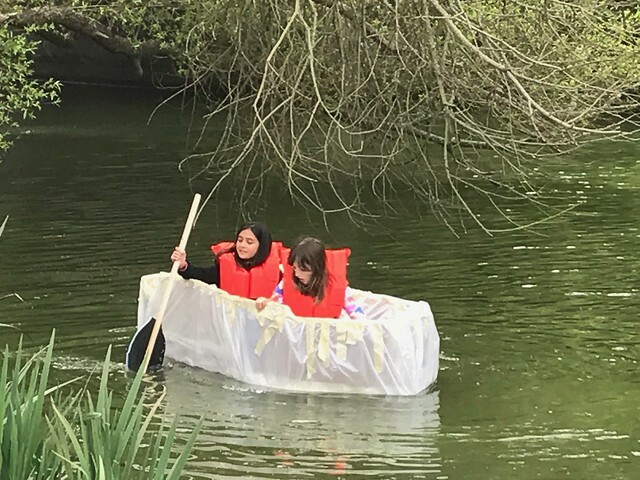 They calculated the volume of their boats and figured out the weight of the water it would displace. They predicted that both of the boats would be able to carry over a thousand pounds of weight. Theoretically, these boats could carry a couple of 9 and 10 year olds with no problem. 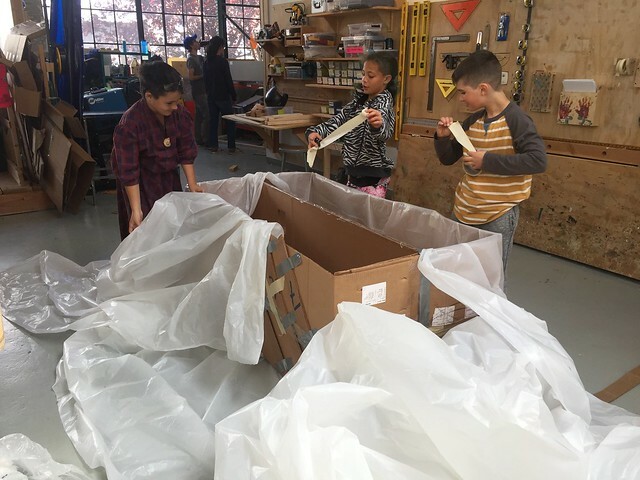 Their final step was to wrap their boats in plastic to protect the cardboard from turning to slush. 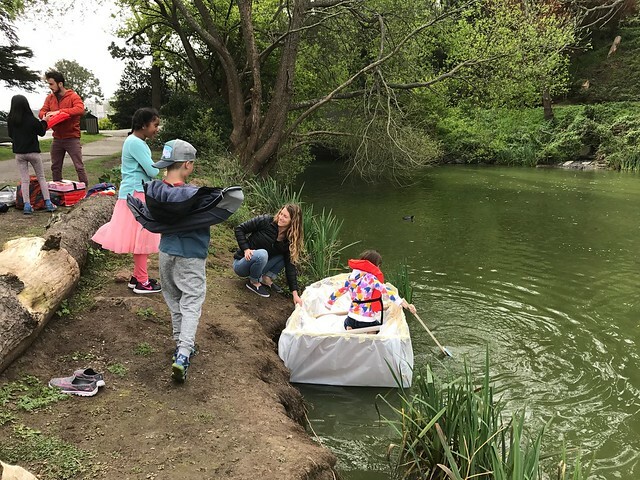 Despite the mathematical modeling that predicted the boats could carry thousands of pounds, everyone was dubious of these boat’s ability to actually float. Before leaving for Stow Lake almost everyone predicted disaster. The boat will flip over, the walls will cave in, they will sink! 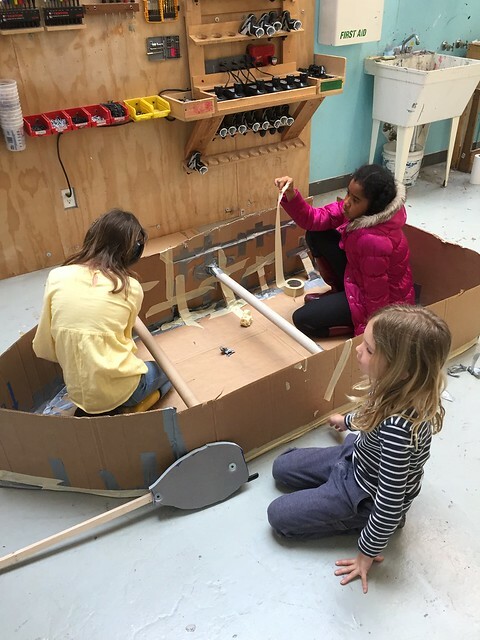 Because the kids had envisioned all the ways that these boats would fail, the moment when Soleil and Sadie stepped into their boat for the first time was met with shrieks of delighted disbelief. As they pushed off into the lush green waters of Stow Lake the crowd of on lookers accumulating on the banks cheered. The second boat was just as much a success. 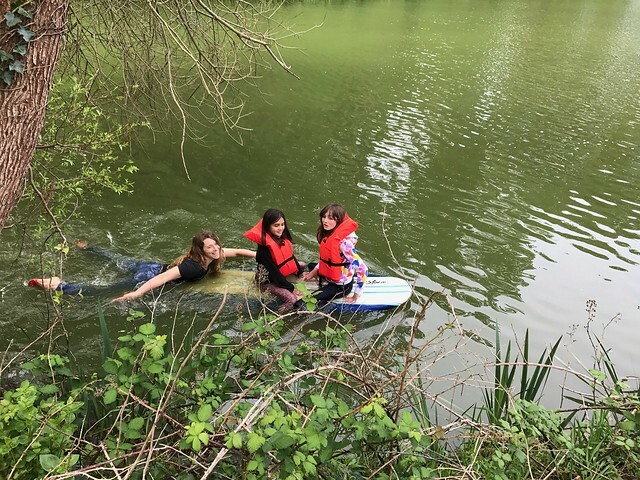 As Gita and Lily glided out onto the lake passerby’s stopped to ask the kids left on the bank what the heck was going on. 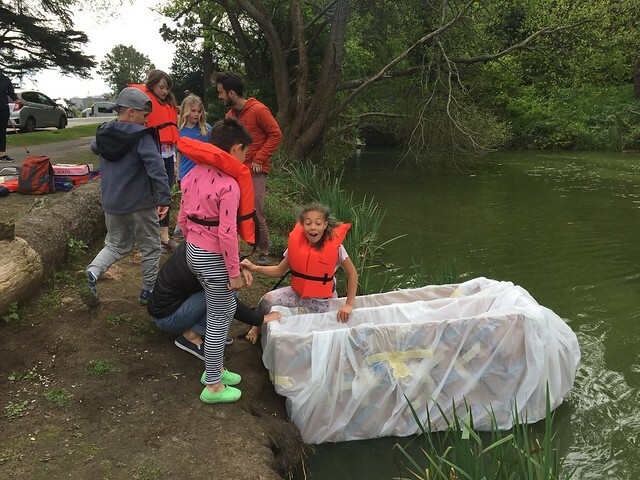 What kind of strange and amazing school is this that sends students out in homemade cardboard boats! It was a beautiful day to paddle on the lake. After 15 minutes or so of leisurely paddling both boats started to take on water from tears in the plastic. 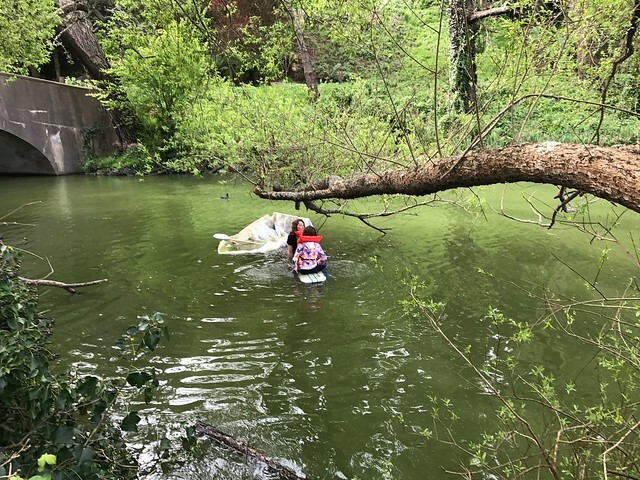 Sadie and Soleil were able to paddle back to the bank before they had taken on too much water. Lily and Gita, however, got stuck in some trees and weren’t able to paddle back to shore. I had to make a rescue on my surfboard! Whether they felt upset or exhilarated by their experiences in the sinking boats, the sailors and their teams met the challenge with bravery and compassion. Later, having changed into dry clothes, the band gathered over hot cocoa to appreciate each other for the contributions they made to this ambitious project. They reflected on the part they played in their group and ways they would like to grow as a team member. A toast to the blue band who met with challenges and didn’t lose sight of the most important thing: each other! 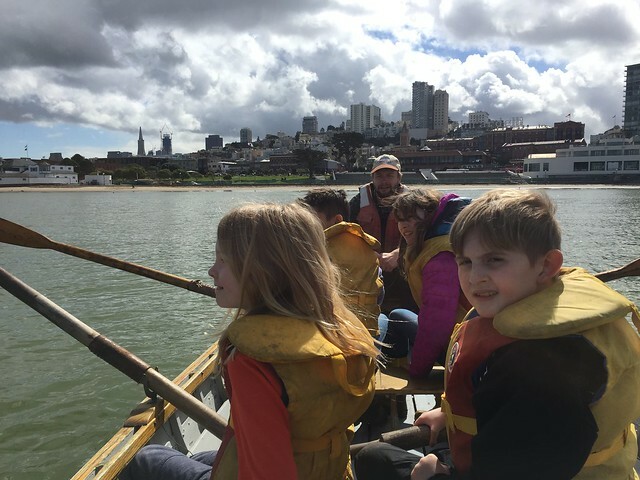 As one of our first field trips the Blue Band went to the aquatic park to learn how to both row and build a boat. It was a beautiful day to be out on the water. Excited by the experience of rowing in the bay the band was a buzz with aspirations of building their own boat. Before diving into that ambitious project we had to better understand why things float. 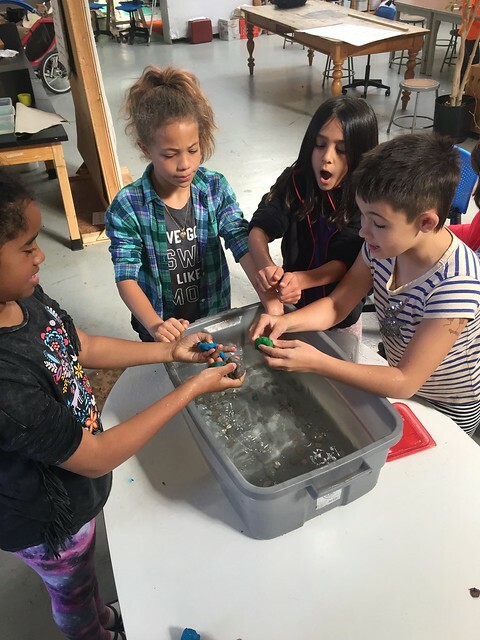 “What are the qualities of something that floats?” This is the question that launched the Blue Band into an exploration of buoyancy. To answer this question our intrepid young scientists have rolled up their sleeves, formed hypothesis, tested those hypothesis and of course gotten wet in the process. 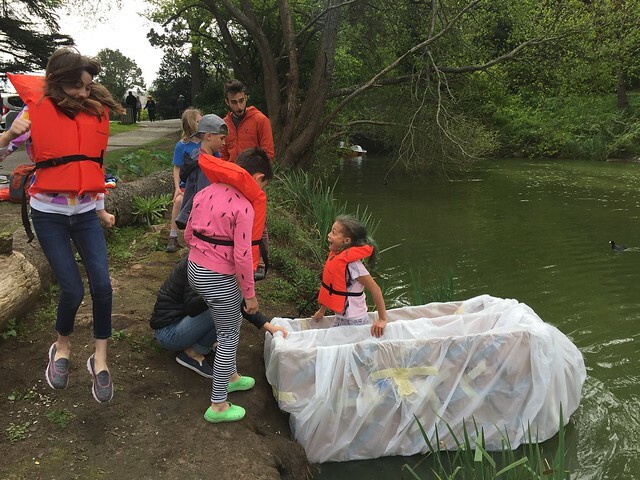 The first experiment: Will it float? The Blue Band found objects around the school to drop into water. First they made their predictions about whether the object would float and why then they tested their objects. There were some surprising findings. Despite predictions, a heavy paintbrush, whose bristles were cased in metal, actually floated. My heavy thermos that is made of metal also floated. 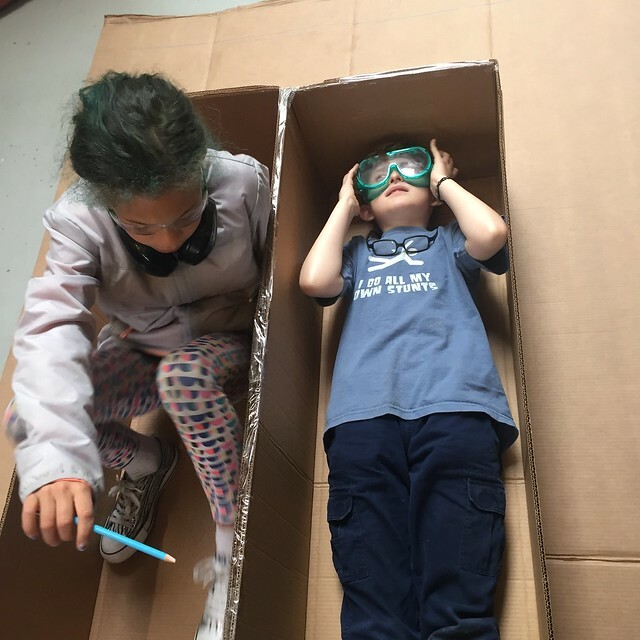 These surprises helped the young scientists revise their definition of what floats. 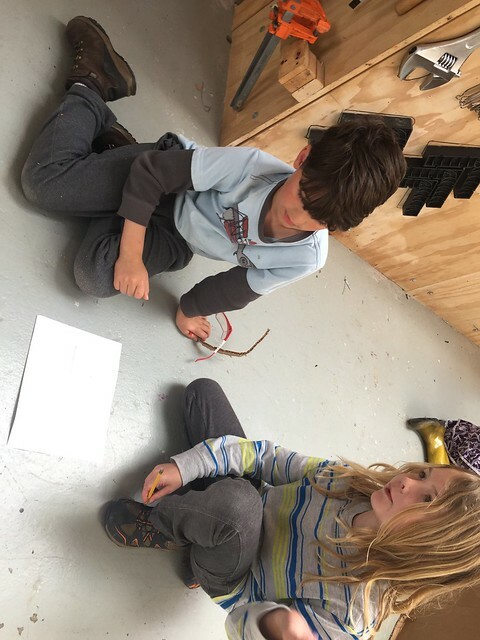 They had discovered that there were three important variables: size, weight and shape. In our next experiment we endeavored to find out if there is a relationship between size and weight. We had been using graphs to find patterns in data so we decided to collect and graph some measurements. 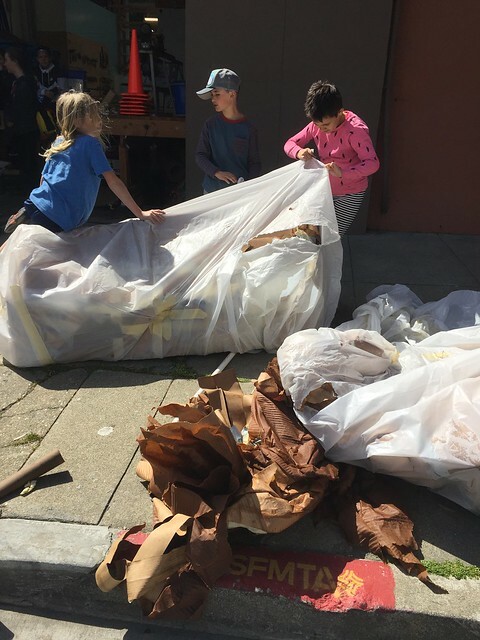 In four teams of two the students weighed bags of wood, ceramic, PVC and steel. Then, using the Archimedes principal of displacement, they figured out the volume of each material. They graphed these points and discovered that their data points formed a rough line. Upon discovering this relationship we put a name to it: Density. Things that are small and heavy are more dense than things that are big and light. Interpreting the graph the students discovered that the wood was less dense than the water, where as the PVC, steel and ceramic were more dense. The wood was the only material that floated! One of the qualities of something that floats is that it is less dense than water. 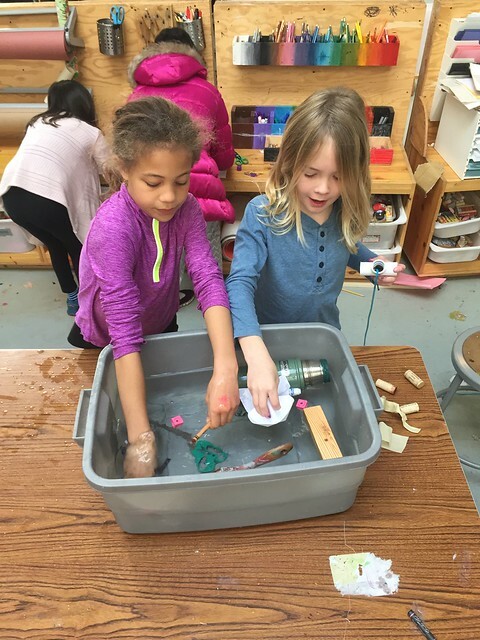 “If steel sinks, why can a ship made from steel float?” Next the young scientists looked at how shape effects an object’s ability to float. They were given a lump of clay that sunk and were asked to create a shape that could float. Next they were given tin foil and challenged to make a vessel that could float the most pennies. They made two iterations and graphed their findings. To bring together all of our explorations, the Blue Band watched everyone’s favorite mad scientist, Bill Nye, explain buoyancy to us. Bill’s message: Things float when the water they displace is greater than or equal to the weight of the thing. This time the blue band designed their own experiment to test this claim. 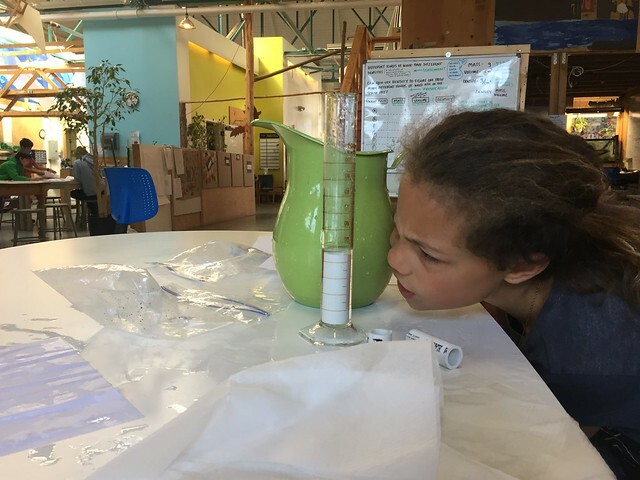 They decided to fill beakers to the brim with water, drop objects in to the water and compare the weight of the water that splashes out with the object. 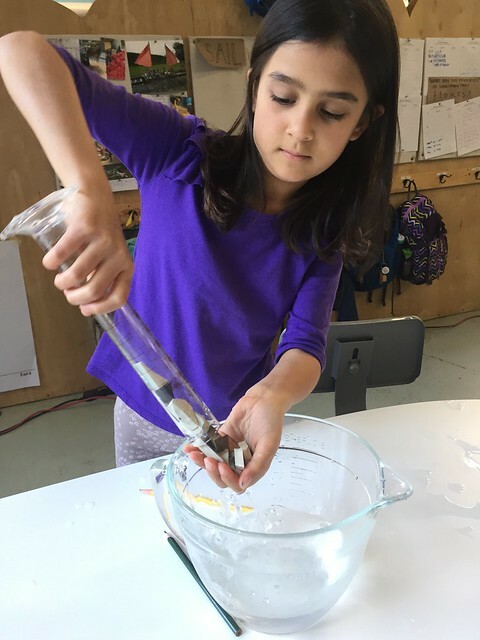 They discovered that the things that sunk weighed more than the water that was displaced and the things that floated weighed equal to or less than the water displaced. Equipped with a better understanding of buoyancy, the blue band has a new challenge in front of them! 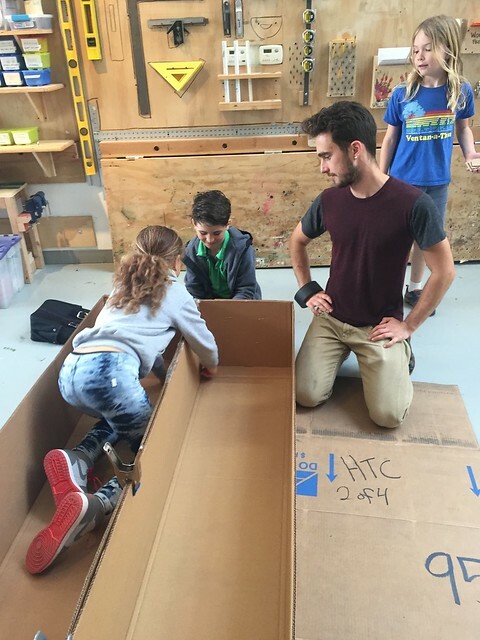 They are building boats from cardboard and plastic that will float at least one person. 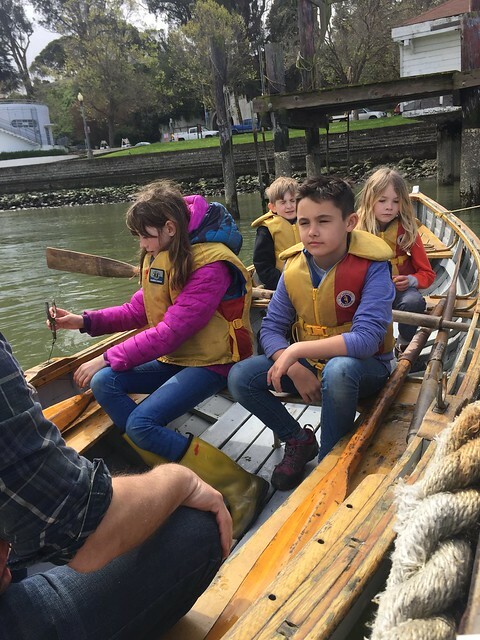 As you have heard, I have been taken on a ship…the Captain calls it “being shanghaied.” The people seem nice, except Mr. Llyod, he is the first mate and is in charge of discipline. You may be wondering, ‘how did I get tricked?’…Well…we (notice I said WE) followed this “Mr. Hawkins.” He told us that there was a ship we should see. So we followed him and he gave a sheet. Now at the time I had no idea what this sheet was and really did not care, but now I realize that I was signing a very important document. “Mr. Hawkins told us of the Joyful life onboard, and the fine pay. Yet, the second we set foot on the ship I knew we had been shanghaied. We were forced to work on the ship with the strict first mate, Mr. Llyod and the not completely sane cook/doctor Onion. (Who became Princess Onion under circumstances I will get to later). The only thing that stopped this voyage from being a complete nightmare was The Captain. He was firm but kind.” Ronan Rigger Crew. “Then on the poop deck a man look and said in a stern voice, ‘Whats this!’ Hawkins walked up at the front of the line. ‘Sir, you said you needed a crew,’ said Hawkins. “We had to raise and lower the ensign and kept bell time.” Pheobe Deckhand Crew. “The sea gulls are crying. The boat is groaning. The sea lions are yowling. The water is flowing, a cool night it is.” Rigger Crew Mate Charlotte.